Dust off your faerie wings and get ready for some very magical winter events at Zilker Botanical Garden. On Jan. 14 you’re invited to the Winter Faerie Tea Party, on Feb. 4, you can attend the February Faerie Tea Party, and as a special post-Valentine’s Day treat on Feb. 18, you can attend the Beloved Faerie Tea Party. Please note, these events sell out quickly and space is limited. Sunday, January 14, 11 a.m. – 1 p.m. OR 2:30 – 4:30 p.m.
Sunday, February 4, 11 a.m. – 1 p.m. OR 2:30 – 4:30 p.m.
Come dressed in your faerie best for a tea party overlooking the garden. Create a greeting card, bookmark, and landscape with pressed plants & practice faerie etiquette. Includes fruit, miniature cakes, tea, and juice. Child must be accompanied by an adult. Sunday, Feb. 18, 11 a.m. – 1 p.m.
Come dressed in your faerie best for a tea party overlooking the garden. Create flower head wreaths with local flora & practice faerie etiquette. Includes fruit, miniature cakes, tea, and juice. Child must be accompanied by an adult. Tickets: $20 for Austin resident child ticket, $22 for nonresident child ticket, accompanying grownup is free. Click here to reserve your spot. Register by Feb. 12. You will want to create an account for your household, including your children, for this and future Parks and Recreation programming. Once your account has been created, select “Zilker Botanical Garden” under Locations for full event listings. Select “Zilker Botanical Garden” under Locations for full event listings. 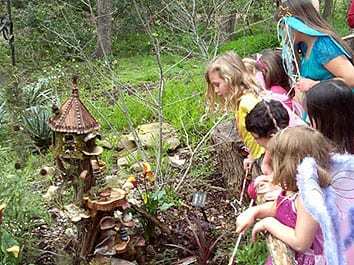 All Faerie Programs at Zilker Botanical Garden are available through online registration only. Austin’s New Year 2018: Music & Fireworks!